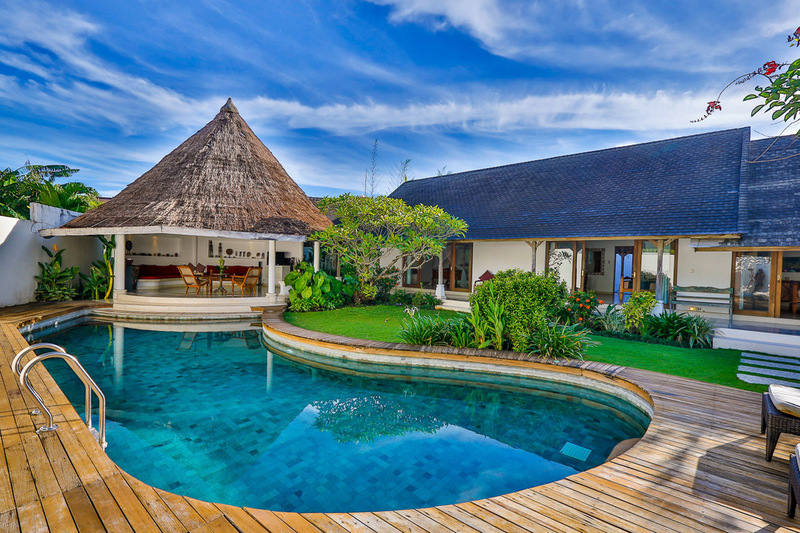 From $ 402 $ 343AUD per night We have direct contracts with most villa owners. We don't add any booking fees. We are 100% transparent with no nasty surprises. 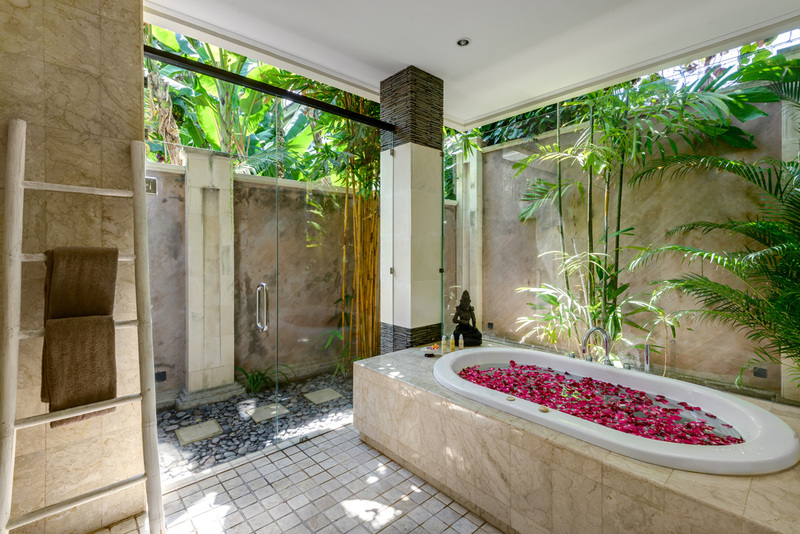 A dream location, right in the heart of all the action in Seminyak – you cannot be in a better position! 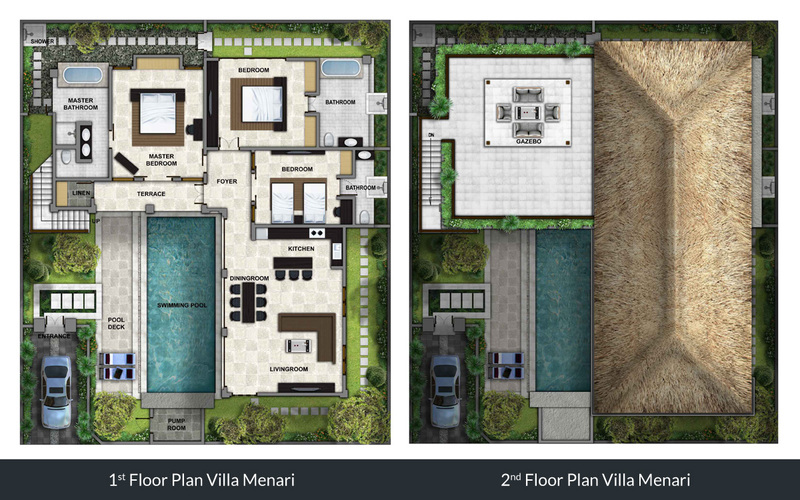 The new shopping mall Seminyak Village is just around the corner. For the nightly price this is great value considering you are getting a 3 bedroom villa with your own private swimming pool in a really popular area – you will LOVE this place! 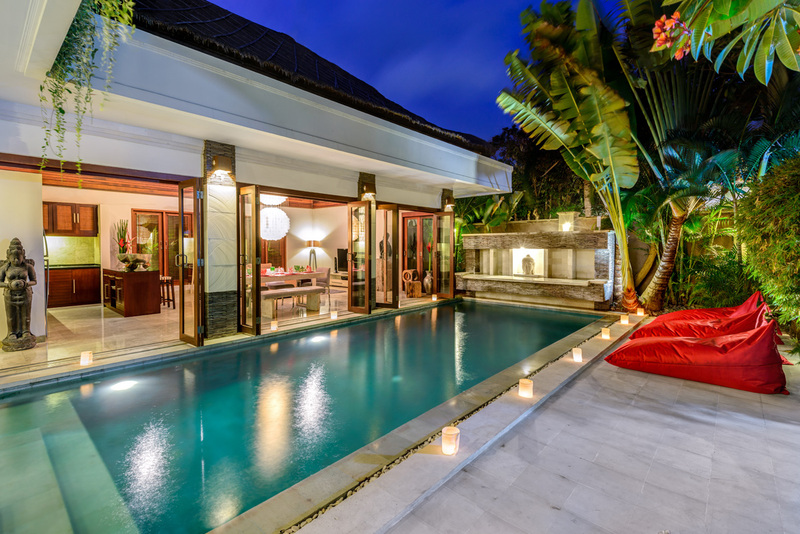 Villa Menari at the Residences Seminyak is a 3 bedroom Seminyak holiday villa rental & sits in the secure gated exclusive Villa Estate, which provides guests with an exceptional level of accommodation and just a short stroll from all the action that sophisticated Seminyak is famous for. 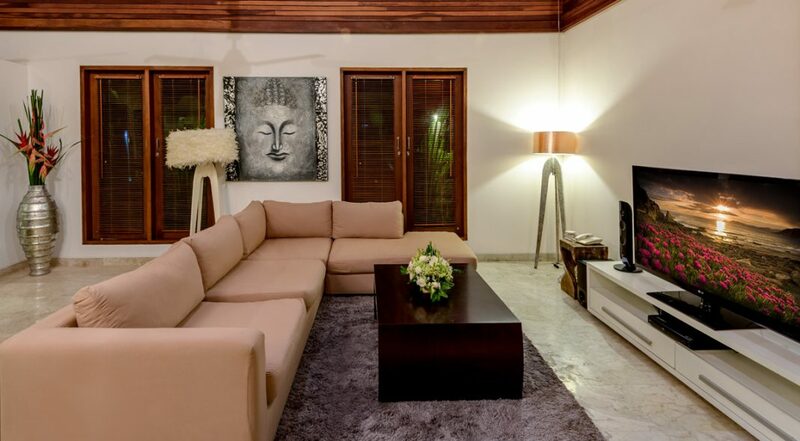 Fine dining restaurants, casual eateries, hip breakfast hangouts, happening bars and fantastic coffee shops are all within easy reach from your villa. 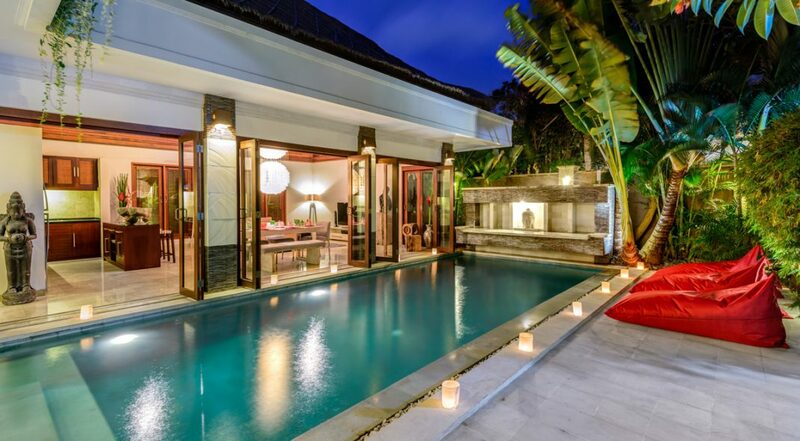 Villa Menari is a tropical holiday Villa located in one of the best areas of Seminyak. 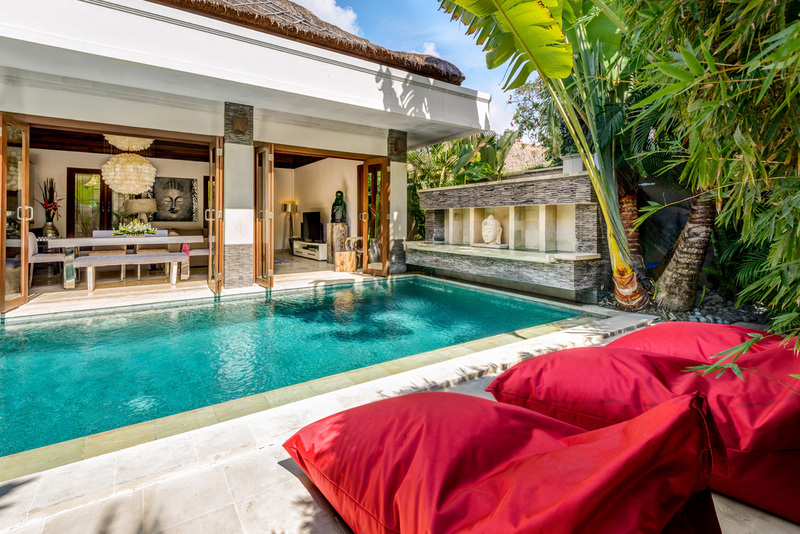 Lay back on the poolside beanbags with a good book before freshening up in your luxurious en-suite bathroom to prepare for an afternoon cocktail on the rooftop sundeck as you enjoy a magical Balinese sunset. 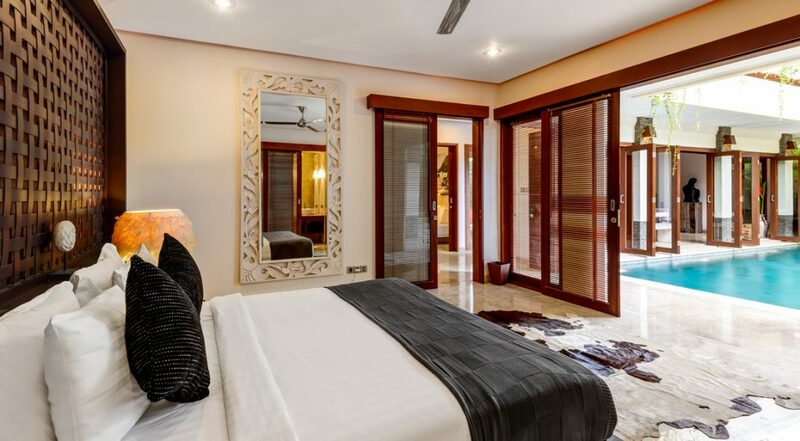 Three bedrooms provide spacious and comfortable accommodation for up to 6 guests looking for a memorable Bali escape. 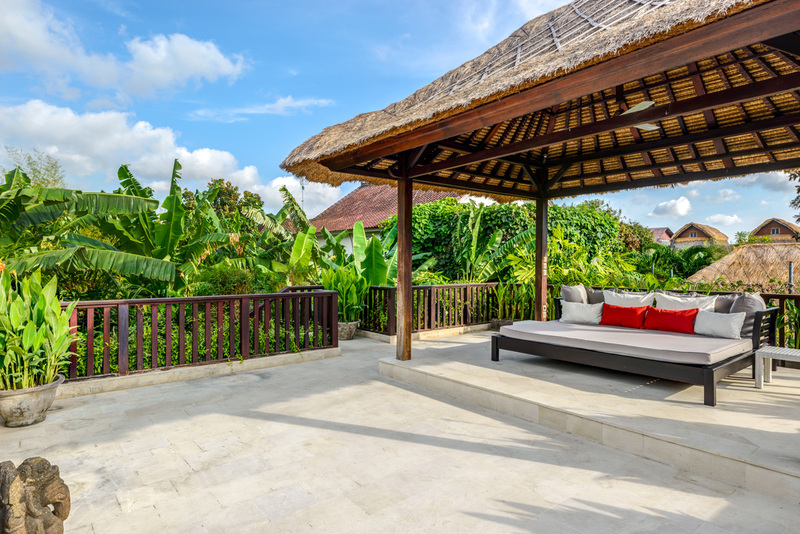 Villa Menari’s outdoor area is enhanced traditional Balinese statues and a water feature adding a Zen element. 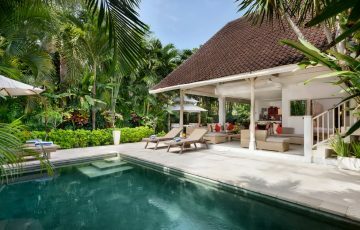 The magnificent private pool is full of lush tropical plants, palms and has two comfortable sunbrella bean bags on the pool deck where you can take respite from the sun under the shade of tall palms. A beautifully carved stone Buddha sits at the end of the pool and upstairs a sun deck is a great spot to enjoy sunsets or just relax with a good book. 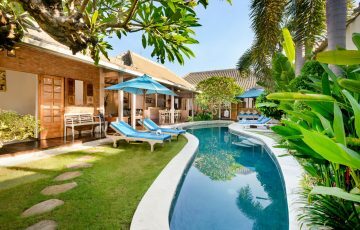 Villa Menari offers guests a tranquil and serene environment that is sure to help you fully rejuvenate and during your holiday escape. The living and dining area looks directly onto the pool where you can open the bi-folding doors creating an alfresco indoor/outdoor atmosphere. 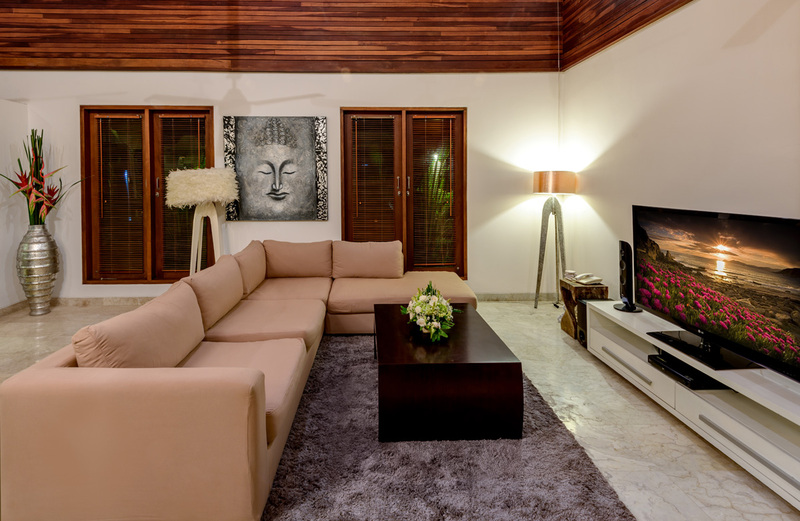 Stylish furnishings consists of a large sofa, traditional Bali artworks hang on the walls and a large flat screen TV is ready for you to enjoy movies or international cable. 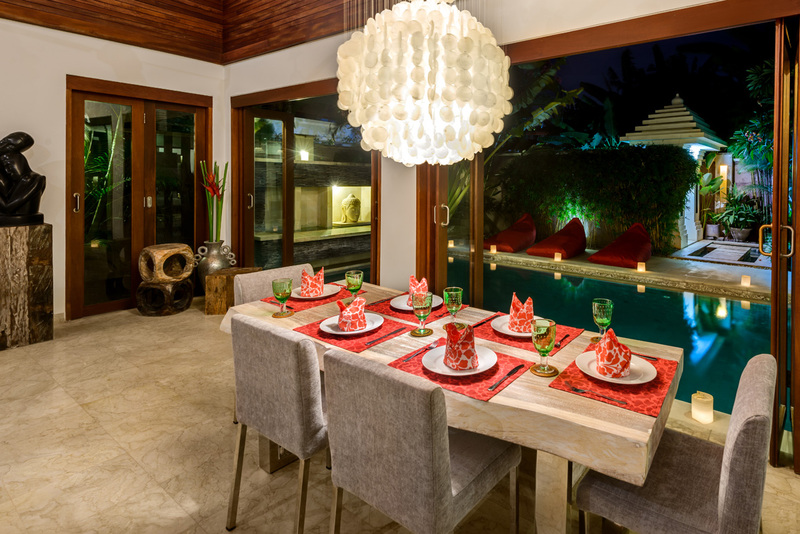 The dining area boasts a rustic timber dining table with a stylish chandelier fashioned from sea shells illuminating the area. At the end of the room the fully equipped kitchen will suffice all your catering requirements. 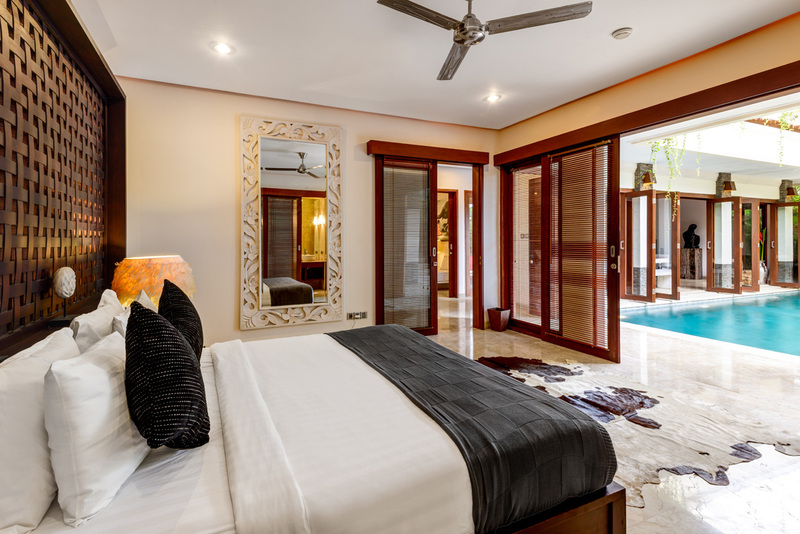 Villa Menari has 3 beautifully appointed ensuite bedrooms. Two have king sized beds while one has twin beds which can easily be converted to a third king if required. 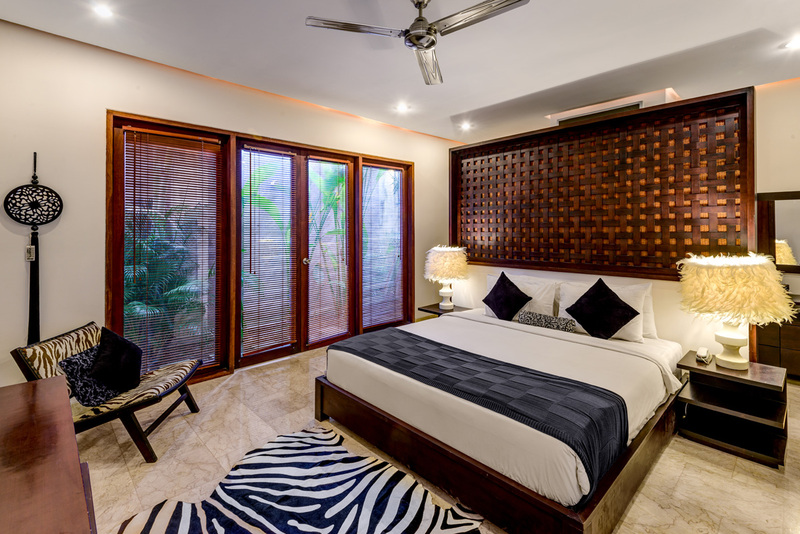 The rooms open up to the pool or gardens via large glass doors, vibrant floor rugs and Asian ornaments make the rooms pleasant on the eye. 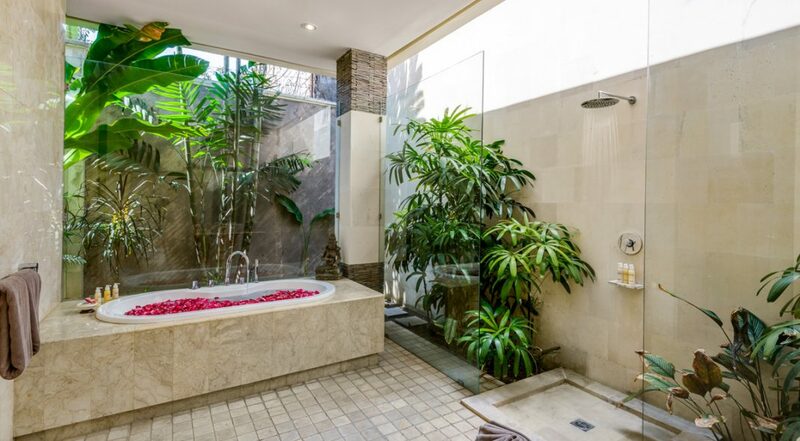 The master and guest suite feature beautiful soaking tubs and rain showers in tropical gardens behind glass panels and the third room a rain shower. The entire villa complex is serviced by a team of staff and each villa enjoys the services of a concierge desk, 24 hour security, housekeepers, chefs, butlers and villa attendants, just pick up the phone at any time and staff will be on your doorstep. 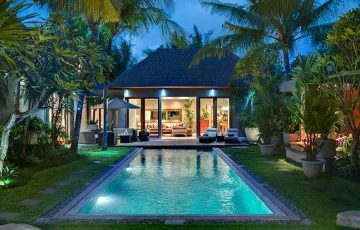 The lovely Seminyak beach is an easy 10 minute stroll from the villa and just a few hundred meters from the villa you arrive at Oberoi, Eat Street right in front of Ultimo Italian Restaurant. Guests can do all their grocery shopping at and find ATM’s at the larger supermarkets at Coco Mart and Seminyak Square & the newly built Seminyak Village with a full array of imported items and produce. Happy Chappy’s, Sisterfields, Motel Mexicola, Potato Head, Mrs Sippy, Drfiter & Ku De Ta are all close to the villa. 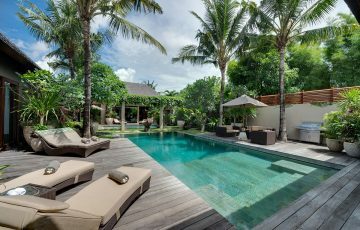 To view other amazing Seminyak villas near Eat Street or our full range of Bali villas that are perfect for your next holiday please browse this website or contact our reservation team. 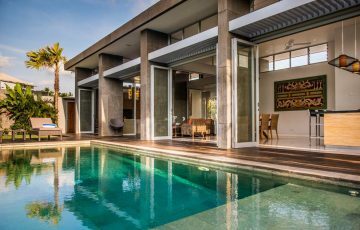 This is a popular Seminyak villa rentals so please book Villa Menari well in advance, especially if your planning a trip to Bali during the Australian school or public holidays. I never wanted to leave Villa Menari. Although it's super close to all the fab restaurants in Semniyak; like Sisterfields, Motel Mexicola, Ku De Ta etc, all I wanted to do was hang at the villa. The staff were there when ever our family needed it and we just loved the breakfasts that were cooked up for us every morning - fresh and really healthy. 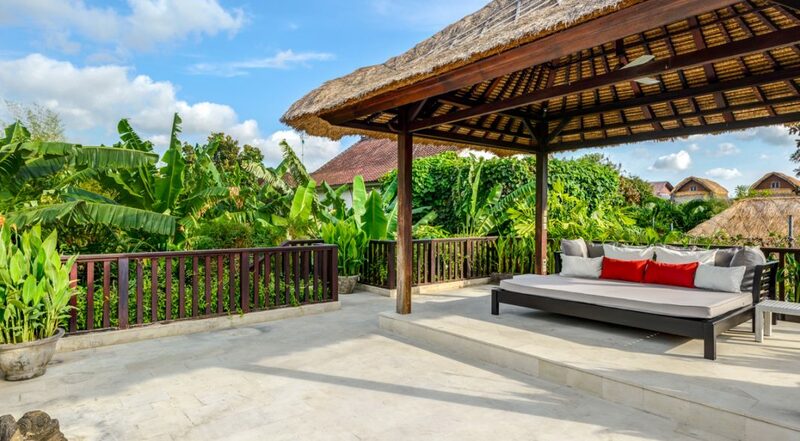 This villa itself although in a central position, is really very quiet & very private - Plus there is security so it's really safe and secure, which was an important factor for us. 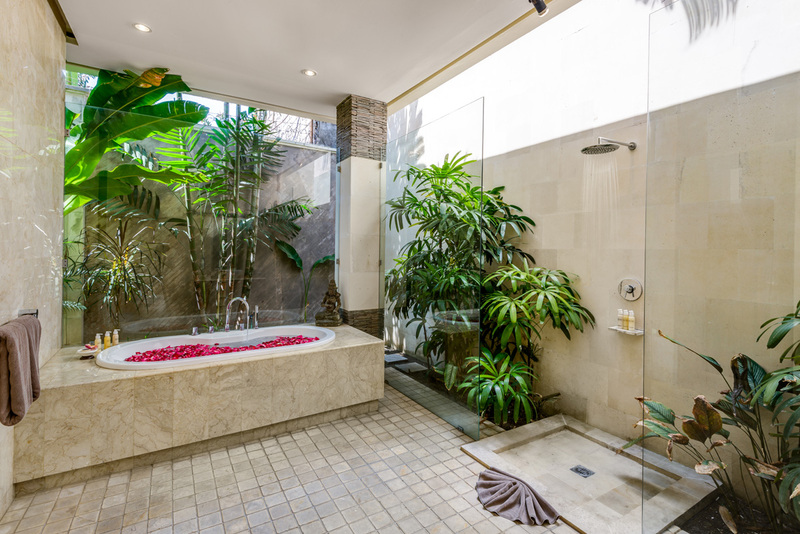 Also wait till you see the bathrooms, they are enormous - you will love the outdoor showers and bathtubs. It has the feel of a luxurious home. Can't rave about this place more than this except to say I am heading back next year for a week...can't wait! Came over to Bali for a friends wedding, 6 of us stayed in the villa for 8 nights. 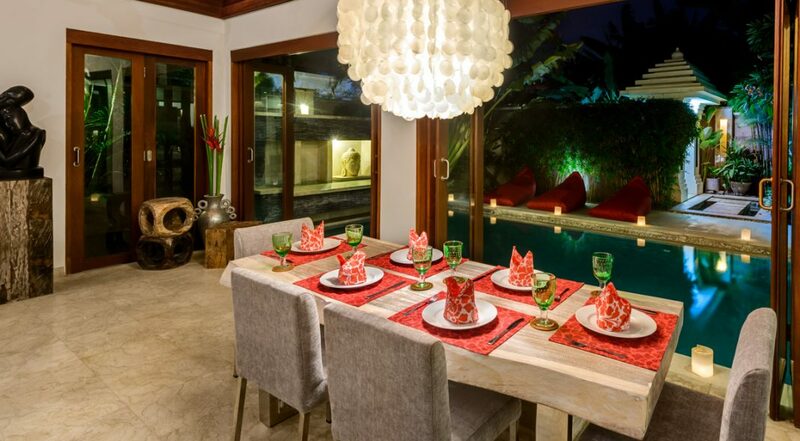 The location is perfect, right near "eat street' in Seminyak, photos don't do this villa justice, rooms are huge, pool is a great size, staff were very friendly and helpful, if we ever need a villa again for a group of 6 this will be the one we choose. Thanks to Ina, Dewi and Yayuk and the team at Bali Villa Escapes for organising this at such a short notice. We stayed at Villa Menari for a week over Christmas and loved it from the moment we arrived. The staff were extremely friendly and were there to welcome us, even though we arrived very late. The rooms were gorgeous and the ensuites were totally luxurious. 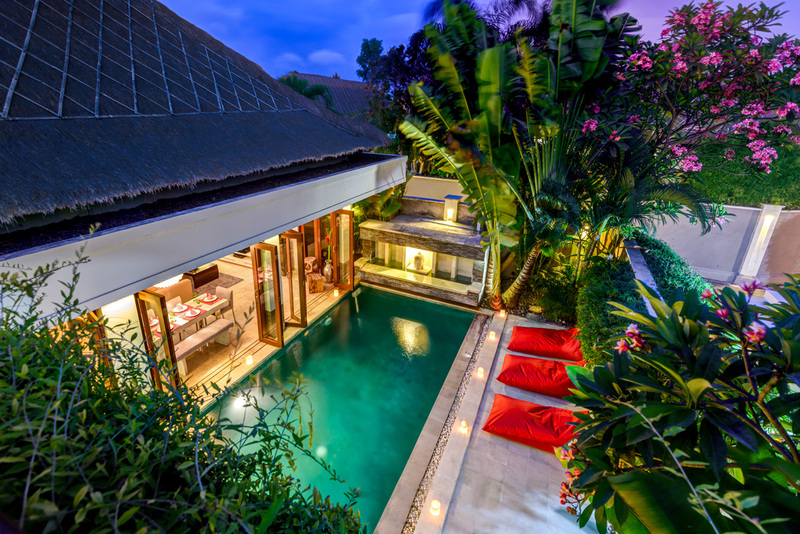 A huge bonus was the location of the villa which was really central in Seminyak and close to the beach as well. I highly recommend staying here if you have a family and easily give this a 10 out of 10 - it really was one of the best family holidays we have ever had and the villa was the main reason for this. Anita and I just wanted to say a heartfelt thank you for your assistance with our recent stay at Bali. Villa Menari was stunning and perfect! 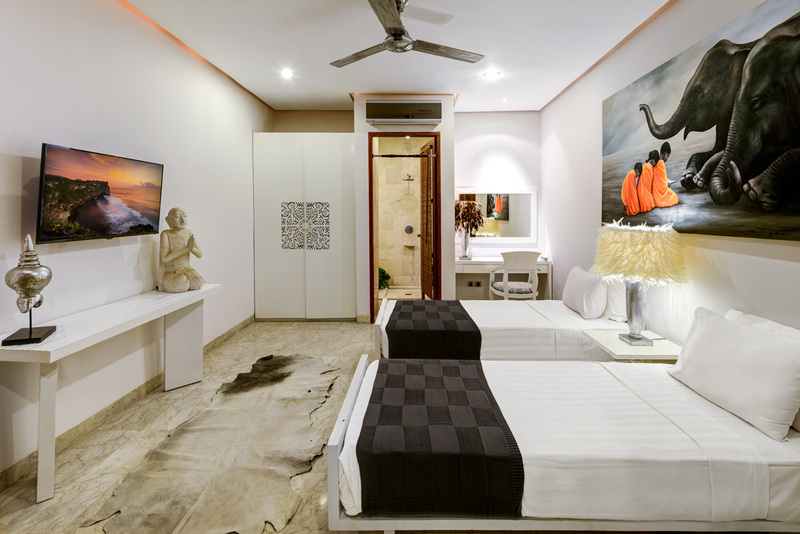 We had a wonderful time exploring Seminyak and look forward down the track to using your services again. The team at “the Residences” were very welcoming and our butler made awesome breakkies! All I can say is Im so happy I stayed here. Loved the location near my favourite 2 restaurants in Bali; and Hanks Pizza. Definitely coming back. Lovely villa in a really good location - your going to love it!! Our villa was amazing. 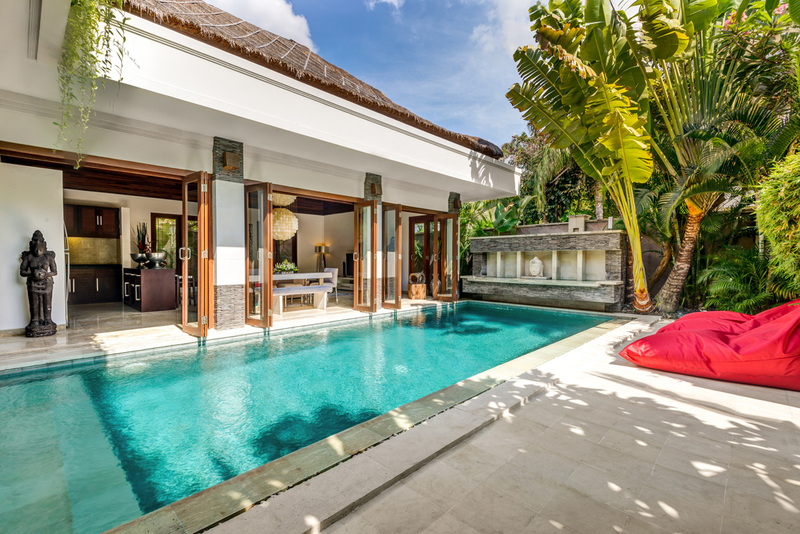 This is the 2nd time that I have booked through Bali villa escape and I have no hesitation in using them again. Everything was well looked after nothing was a problem I would recommend them to anyone. To all the staff at Menari especially Nina your the best - thanks for such a great holiday. 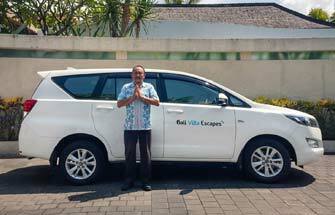 I thought Bali Villa escapes were very professional and knowledgeable. Always answered my questions quickly and I would have no hesitation in recommending them, and I will most certainly be using them again in the future!